I am sitting in the airport, on my way to Sanya, Hainain Island right now. It is said to be the nicest beach in China, an island located in the South China Sea, actually a bit past (West of) Hong Kong. Becky and the kids and Hal and Ruth are already there. Really looking forward to getting there for some relaxation and reconnecting as a family. It was great to have Jacob and Eli back and I am very proud of them for how well they seem to have done in the U.S. without us. Thank you to everyone who helped make their trip so successful and memorable. They really had a blast. 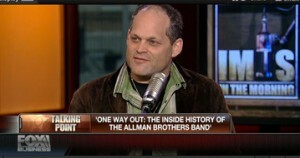 The reason I am a day behind everyone else is Woodie Alan had a big gig last night, scheduled long ago. 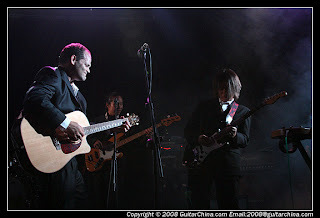 We played at Star Live, the biggest non-arena venue in Beijing. I have seen the Roots and Sonic Youth there. Capacity is probably close to 2,000 if packed in tight. 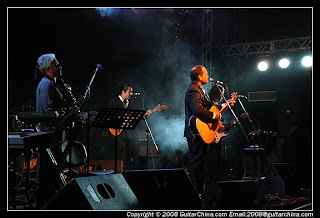 We opened for Zhang Ling, a pretty famous guy who played bass for Chinese rock godfather Cui Jian for years. The night was sponsored by Guitar China, a guitar website, and they did a story there. I look like hell – these pictures more than anything told me how badly I need this vacation! – and I can’t read the story any butter than you, but it was a great gig and I am still feeling an electric jolt the next morning. There were about 300 people there, virtually all of them Chinese – they did zero publicity in English language press. We played all originals until the last two songs, which were “Will the Circle Be Unbroken” and “Soulshine.” “Circle” is an old traditional American song. We start it out with a Woodie guitar intro, then I sing the first verse along with guitar, then the band kicks in. As Woodie was playing his extended intro, I raised my hands over my head and started clapping and the whole place began clapping along and it was one of the great moments of my life. Not because of egotism or leading people or whatever.. but because I had a roomful of Chinese people clapping along to an old Appalachian song popularized the Carter Family. I don’t what that really means, if anything, but to me it means a lot. This music has meant so much to me in my life and shaped my view of the world to such a large extent. For various reasons, I feel like I lost touch with the centrality of music in my core, and the band has brought that back for me. I have never felt prouder of being an American and more conscious on a deep level of what it means to me than when singing these songs in China. I really can’t explain it any better than that. I’m sure that 99 percent of Chinese people listening just hear music, but I feel like some tiny few hear America in there. I know I do, and I also know that I never, ever could have figured out how to express what was in me without these great Chinese musicians prodding it out of me. I am still working this out – this is a first draft of an idea – but on some level, this is the very essence of the upside of globalization. I don’t mean to be grandiose – just the opposite. I feel like the real potential for cross-cultural communication and understanding lies in many small moments of interaction rather than in anything large or state run. We played great last night, really rising to the challenge. My singing was better than it has ever been. I heard things coming out of my throat that surprised me. I don’t know quite how to explain it, but since we decided to leave, I have stepped up to another level. Woodie said, “well, you got the blues.” There’s some truth there, but it’s not just that. I f I knew quite how I did it, I would have done it long ago, but something clicked or snapped inside me and I crossed a line and abandoned whatever inhibitions held me back. Part of it as simply realizing that this is not going to last that much longer and I don’t want to walk away with any regrets or potential left untapped. The musicians I have always been attracted to lay it all on the line and their ragged passion is their charm. I have never sought perfection in music. I’ll always take the guitarist playing somewhat sloppy licks because he is trying to get at the root of something and find something new than a guy playing perfectly placed licks because he has worked them all out and is playing a composition instead of an improvised solo. It’s what I have always strived to do with this band, and I feel like we are getting there now. We have gotten tight enough that we can loosen up and let go, secure that if one person stumbles, the band will catch them. That kind of security and confidence is what allows you to really push and see how far you can take something. As we prepared to walk on the stage last night – from our dressing room, a first for us – Dave said to me, “Man, a year ago I couldn’t have imagined that we would be walking onto a stage like this.” The truth of that statement is beyond self-evident. We have really come a long way and I honestly feel that we are nowhere near topping our potential. We have played a ton of gigs together and the mileage we have put on has really paid dividends. I could torment myself thinking about the potential we won’t have a chance to fulfill, but instead I am going to really work to book us an American tour next summer. I really want to see where we can take this and will do what I can to make that happen. I also truly believe that the time is right for more American/Chinese cultural exchanges. If we can serve that function while also furthering our own goals and ambitions, more power to us. Joe Ben thinks it has to do with communicating FREEDOM to a large group of people (who have been deprived of it)in the most primitive of ways. Saying I love it….I would love for you to have it….here is how it feels…….